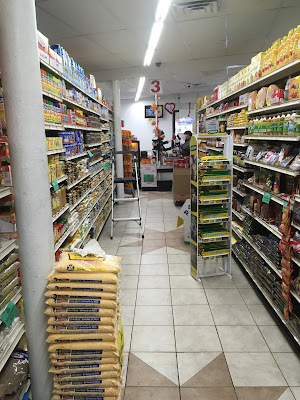 Last summer, we saw the Eagle Supermarket of Elizabeth, NJ. The owners of that store opened a new Eagle Supermarket in Roselle in 2008 and sold the original location in Elizabeth, but the new owners decided to keep the name. Here in Roselle, it's hard to tell exactly what the building was previously. I doubt it was a new-build store, but it was at least extensively renovated. It's a tiny building! This store is on St. Georges Ave (St. George Ave, according to some), in a stretch that historically has not been the greatest neighborhood. The area has picked up, though, and this 10-year-old supermarket is indicative of the general trend of revitalization along this corridor. Except, come on, can't they get a new M? You enter on the right to dairy in the first aisle and frozen foods along the back wall. 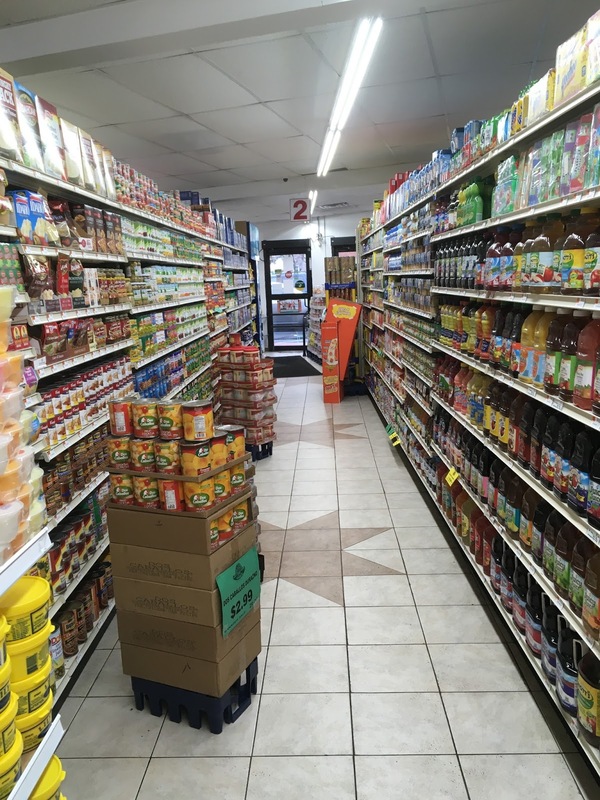 Meat, produce, and deli are actually in a separate room to the left. 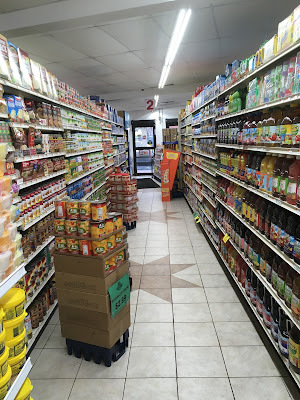 I came here after visiting the SuperFresh in Roselle, and it felt like this store had more shoppers than SuperFresh! The first aisle, with dairy to the right. It continues along the back wall. The flooring is interesting. Rather than the usual white vinyl tile, this store uses tiles that actually have depth, like you might put in your kitchen. The lighting is updated LED. Looking back up to the front wall. Looking along the back wall. On the other side of the wall you see straight ahead is the meat/produce room. The store is so small that the aisle markers don't even list the products in each aisle. I was impressed that the store's prices weren't crazily inflated because of the store's convenience. In fact, several items were actually cheaper here than what I had just paid at SuperFresh. 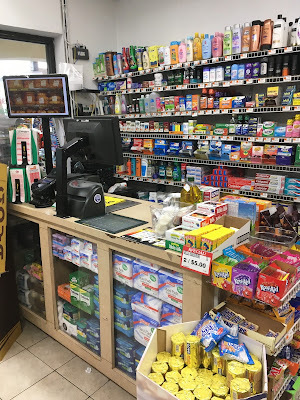 As is frequently the case with these small stores, there is a large selection of nonfood items for sale, which must be very handy if you live in the neighborhood. Customer service in the front corner. It's amazing the store even had a customer service counter given its size! I think there are three registers. Just to the right of customer service is the doorway into "Deli-Meat Product", the last word of which I think is supposed to be produce, since that's the other department located in this side room. Although it doesn't look like it here, I can tell you this butcher counter was packed. The deli is tiny! Produce is in the back of this room. 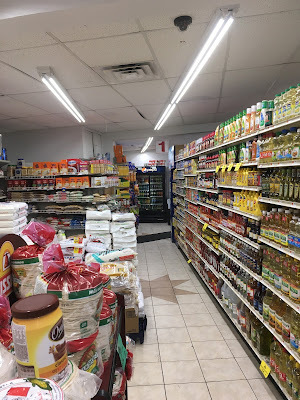 Small supermarkets like this are much better, as I've said before, for a neighborhood than a similarly-sized store like a 7-11 or a Wawa because they have significant selections of fresh products, especially produce and meat. It didn't occur to me that this mirror is a window to the manager's office until after I took this picture. Luckily, no one was in the office on this Sunday afternoon. My theory is that this building was previously an auto shop. This section of St. George is full of car dealers, shops, and car washes, so it would fit in nicely. It would also explain the two rooms -- where grocery, dairy, and frozen are would have been the repair bays, and the meat and produce room would have been the office. Can anyone confirm this?